We’ve gotten all the songs written, and the basic tracks are done. Next, it’s adding the vocal arrangement and Lead Guitar parts to the tracks. We’re happy with how this is coming together, and Diana has been posting some pics of the sessions on our Facebook pages. As a change of pace – this E.P. 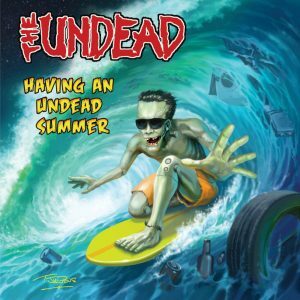 is a tribute… Undead-style… to the beach movies of the 1960s. We’re having a lot of fun recording this; and it’s great having Diana co-writing the songs. The new E.P. is coming along. So far, we’ve written 3 songs for this, and are working on the lyrics for a 4th. Diana is making a major contribution on the lyrical end. In addition – she’s been picking up the guitar more than ever, and has come a long way – enough to handle lead on one of the new songs already. In addition – we’ve been in contact with an artist – who is best-known for his work on the cover art for a series of horror-based children’s books. We’re looking forward to seeing how this one develops, also.